With St. Patrick’s Day Parade scheduled for March 11, a week in advance of the actual St. Patrick’s Day weekend, Pittsburgh has the opportunity to celebrate all week long. Last night at Riley’s Pour House, bagpiper John Walsh kicked off the weeklong celebration by marching through the pub in advance of our 8:00 show. 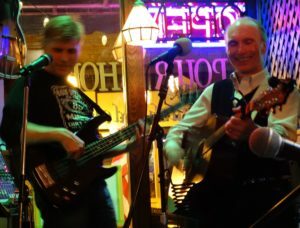 John will be returning to Riley’s today along with the likes of Young John Gallagher, Mike Gallagher Himself, the Irish Belly Dancers, and … [more at The 21st-Century Scop]. This entry was posted on Saturday, March 11th, 2017 at 9:42 am and is filed under Uncategorized. You can follow any responses to this entry through the RSS 2.0 feed. You can leave a response or trackback from your own site. Powered by WordPress and delivered in 0.209 seconds using 46 queries.